Janice McHaffie wishes to use this residency to create paintings that openly talk about the underlying stigma surrounding conversations around death and dying. McHaffie believes that she is on a quest to encompass, explore and create on canvas abstract pieces that signify and represent both the positive upheavals and the negative breakdowns in life. She wants to portray the world’s rich texture through meaningful and powerful works of abstraction. In addition to using various academic techniques, McHaffie also uses some abstract art methods that she invented while recovering from a brain injury, during which she lost use of her dominant arm. She now uses one or both her arms to paint. Having conversed with people who have had near-death experiences, she hopes to recreate their vivid visions using colour, line, shapes, balance, form and composition to depict life changing events and the possibilities beyond. The colour in her abstract pieces is usually bold, vivid and helps tell the entire story. McHaffie also believes in engaging with her audience wholly, painting directly in the gallery space to allow a more fluid interaction between artist and viewer. By the end of her residency, she hopes to create a collage and a sculpture using pieces of paper and ribbon left by the viewers in remembrance of people or animals that they have loved and lost. McHaffie believes she is on a quest to encompass, explore and create both the smooth edges of tranquility and the rough edges of difficulties to replicate the rich textures of life. 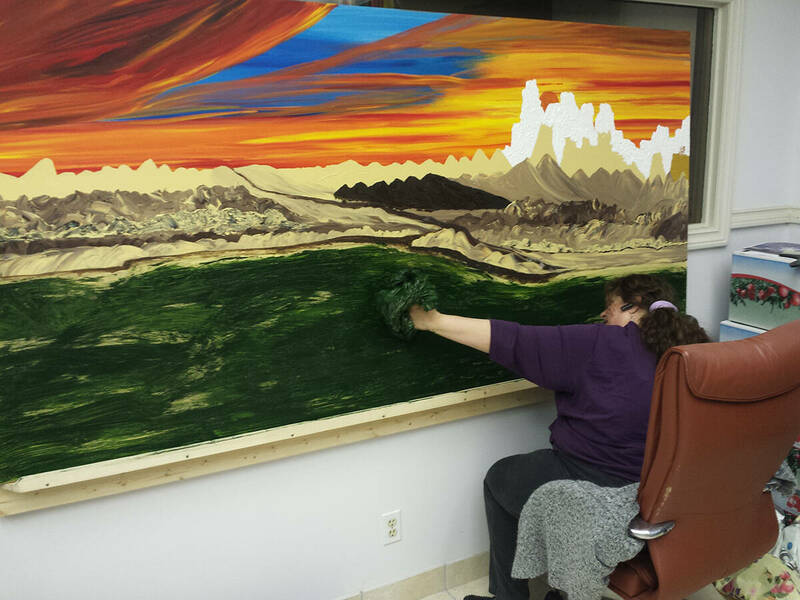 During the residency, she will be painting abstract as well as figurative artworks for her new series, “Dying and Death: A cultural conversation.” She uses various techniques including those she invented when she temporarily had the use of only one arm after sustaining a brain injury. Having conversed with people who have had near-death experiences, she hopes to recreate their vivid visions using colour, line, shapes and form to depict life changing events and the possibilities beyond. McHaffie wants to create a body of work that will allow a more relaxed and fluid channel to converse about dying and death. 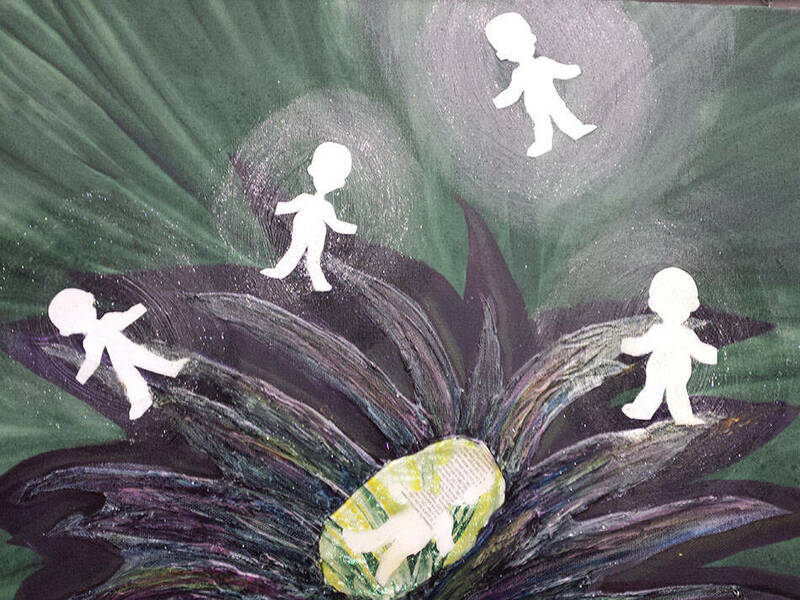 The hope is that her paintings will remove some of the stigma that surrounds conversations of dying and death. 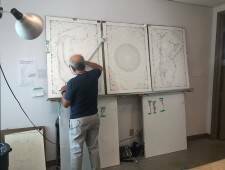 This residency allows the public to view the process in creating these works. McHaffie wishes to share her perspective on life and death through her paintings and to engage with artists residing in the Durham Region.